Q: Why was Radio Lollipop set up? A: In the 1970's a young man working in UK hospitals recognised that hospitals are a scary place for children. He reasoned that if they could forget about where they were for just a while, it might help them get better more quickly. In 1979 Radio Lollipop was developed and launched as a one-off volunteer service to add some fun to a child's stay in hospital and brighten the road to recovery. It was so successful there are now Radio Lollipop stations around the world – and growing. Q: I am only 14 years of age, can I become a Radio Lollipop Volunteer? A: Unfortunately, you can't become a Hospital Ward Visiting Volunteer just yet as Radio Lollipop Volunteers must be 18 years of age or older. However, you can still join in by supporting Radio Lollipop at external events such as our RoadShows and helping to raise much-needed funds to keep Radio Lollipop going. Q: Will I get paid for being a Radio Lollipop Volunteer? 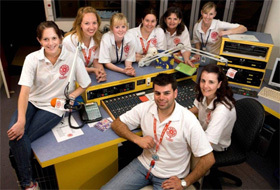 A: The Radio Lollipop Volunteer post is voluntary and therefore unpaid. A: Our Volunteer Co-ordinator will send you a Volunteer Application Form and Health and Security Clearance forms (this may vary depending on your location). Being a Radio Lollipop Volunteer is serious fun, but demands a significant service-based commitment on your part. Please carefully consider your schedule and your ability to commit your time. Q: Do I have to have worked with or had experience with children? A: This is preferred, but not essential. A desire to work with children is more important and, should you be accepted as a Radio Lollipop Volunteer, ongoing training and opportunities to learn new skills will be provided. Q: What is my time commitment as a Radio Lollipop Volunteer? A: The recruitment process at each Radio Lollipop station may vary according to local health and security clearance requirements. If you are interested in becoming a Volunteer, please contact your preferred station and they will advise you of their selection process for taking on new volunteers and send all the relevant information. Being a Radio Lollipop Volunteer is serious fun, but demands a significant service-based commitment on your part. Please carefully consider your schedule and your ability to commit your time. Q: Will I have to go on radio? A: Our focus is on connecting with the children one-to-one through play and radio. All volunteers are encouraged to take a turn on the radio, but not until you are well trained. Q: I would like to donate online – is it safe? A: Radio Lollipop takes every precaution to protect our donors' information. When donors submit sensitive information via the Web site, your information is protected both online and offline. We use high-grade encryption and the https security protocol to communicate with your browser software. This method is the industry standard security protocol, which makes it extremely difficult for anyone else to intercept the credit card information you send to us. Companies we work with to process credit card transactions also use high grade encryption and security protocols. Q: I can't volunteer my time, is there some other way I can help Radio Lollipop? A: Yes, of course! We need money to provide the unique Radio Lollipop service to kids in hospital. We will also accept donations of gifts in kind such as craft materials, paper, toys and games and other things such as computer equipment, printers and photocopiers to keep the administration side going. Unfortunately, due to hospital policy on infection control, we are unable to accept pre-loved toys and games, but if you contact your local station, we would love to discuss the many ways you may be able to help.